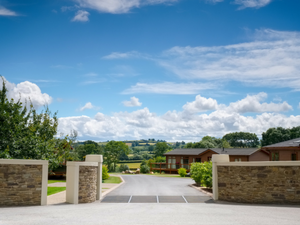 Malvern View Holiday Homes08082566688work Self-cateringMalvern View Holiday Homes is situated in 100 acres of beautiful farmland, and features a stunning Elizabethan manor house and ornamental fishing lakes. Located on the Herefordshire and Worcestershire border and with idyllic views of the surrounding Malvern Hills, this 5-star holiday home park offers outstanding facilities and handy proximity to world-class attractions. Pets are welcome at Malvern View Holiday Homes, and there’s a huge choice of dog walks straight from the park. Spring 2017 welcomes a herd of deer to our parkland, making the views even more special. From A44 From the A44 Worcester to Leominster Road take the B4220 turn-off (signposted Malvern) about 1 mile east of Bromyard. At the Herefordshire House pub turn sharp left, signposted Linley Green, then 1st right down private driveway marked Malvern View Country Estate.